Email is often the overwhelming part of people’s daily work life; there’s too much email, it’s disruptive, and overwhelming. 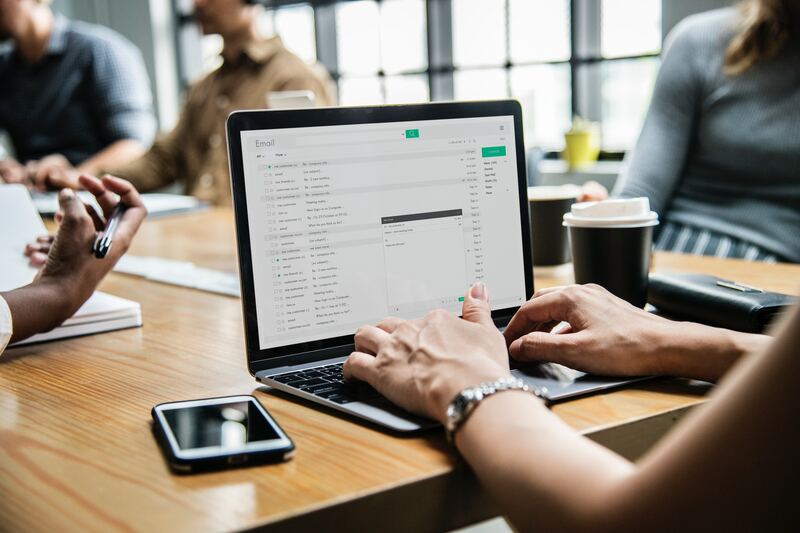 For many, there’s an urge to switch to other communication methods, such as Slack, or texting, simply because their email has become so unmanageable. I am not in that camp – I can manage my email and achieve “inbox zero” all the time. This post will show you how I get to Inbox Zero daily. I rely on a GTD oriented approach to email. David Allen recommends limiting all of your Inboxes, eliminating where you can the number you manage. I try to do that too, but due to belonging to several different organizations, I still manage four distinct email inboxes. I’ll share how I organize them with a GTD approach in the screenshots below. 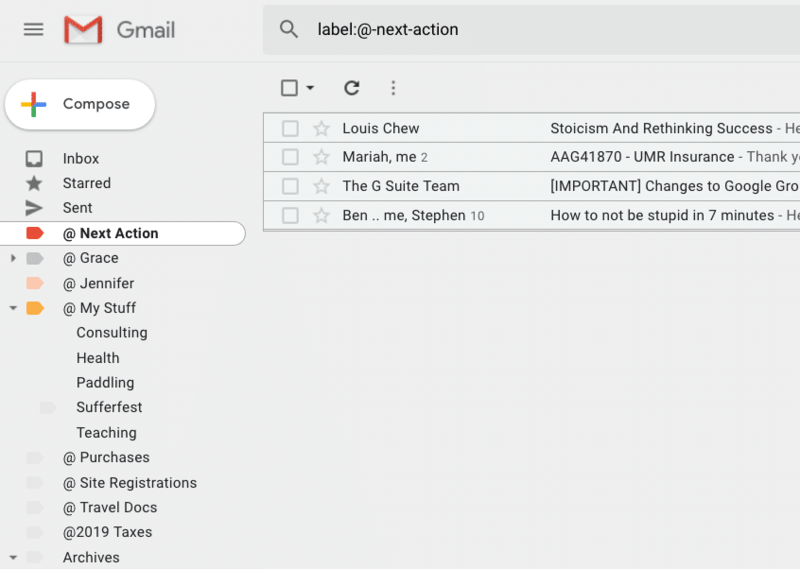 With those four folders (or labels if using Gmail), you should quickly be able to triage, sort, and process a full Inbox. Please note that I put two blank spaces between the @ and “Next Action” to force this special folder to the top of my list. If you start using only this group of folders, you can always expand and add additional structures that make sense for your particular needs at a later date. Why Not Leave Next Actions in the Inbox? I am often asked why I move email out of my Inbox at all if it is an actionable item. I do so because I want to clearly focus on what needs immediate attention – emails I can (and will) respond to in 1-2 minutes, or items that I cannot read properly to triage with the time I have set aside for processing my email. If it’s in the Inbox, there’s an action required even if it is deleting the email or marking it as spam. My “@ Next Action” folder is where I do my real work. Items in this folder are actionable items I need to spend a little time with. Having an empty Inbox does not mean I don’t have email to respond to any longer. Rather, my empty Inbox means I am done categorizing and triaging email with the truly urgent items having been responded to already. Pro Tip: If you’re feeling anxious about not responding immediately to a request that you are moving over to your “@ Next Action” folder, send a note that you have received the person’s email and will respond to it either by a specific date or merely later. This will stop the dreaded follow up conversation of “Did you get my email?” and allow you to set the proper boundary you need for your own work. I have created an “@ Next Action” folder (again, that’s two spaces after the @) for holding all items I believe are (or will be) actionable. Anything I can deal with in a minute or two is left in the inbox and answered right away, and then archived. I have not found the “@Waiting” folder to be useful and prefer to also put these items in my “@ Next Action” folder. Depending on your job role and the number of people you interact with, this might work for you as well. I have separate folders for projects. The ones I am actively working on are nested under the “@Active Projects” folder. (For privacy reasons, I am not displaying the active projects in any of these screenshots.) When a project starts, I set these folders up and have yet to need an “@Someday/Maybe” folder as my projects have all begun very quickly to date. I expect to add this special folder eventually. When a project is completed, I move it to be under the “@Archives” label. Google does such a great job of catching spam that I rarely have to deal with it at all in my Gmail accounts. When I do, it’s quickly handled. The quality of their spam filtering is an incredible time saver and worth the added cost you may pay per inbox for a G-Suite account with your domain. My other professional Inbox is managed in Office 365 or Outlook. My work with Patagonia requires a more detailed organization to manage correctly. 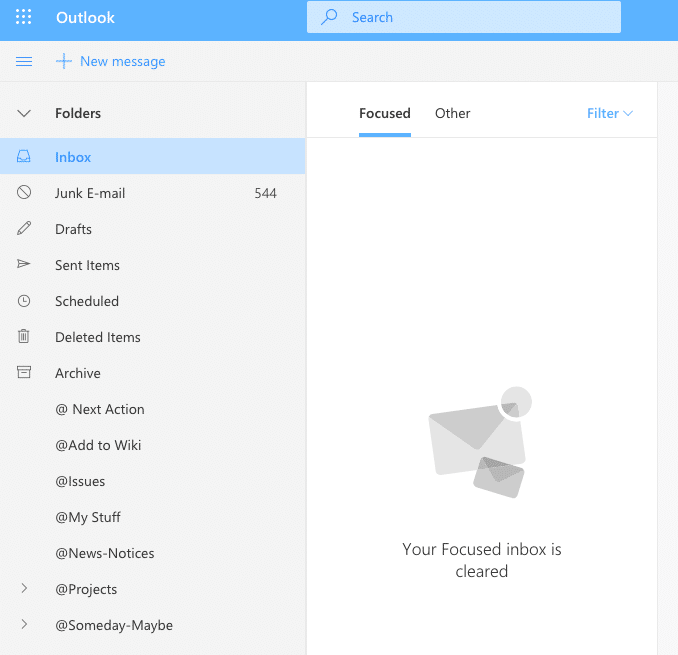 You may notice Outlook has a “Focused” inbox feature. Given my inbox is frequently cleared or at zero, it’s only particularly useful after an absence. I also do not use a threaded view for email either as this just complicates and adds bulk to my views. There’s also an “Archive” built in to Outlook. I choose not to use this feature as Microsoft makes it more of a giant junk drawer while I prefer to categorize my saved email. Again, the “@ Next Action” folder is where my real work lives. Anything in my Inbox that is actionable in a short 1-2 minute time period is still answered right away and then archived. Items that contain instruction or details I want to document elsewhere get moved to my “@Add to Wiki” folder for processing later. Sometimes I will hold the option key down and duplicate an email to be placed in this folder, too. Nearly all of my email gets filed into an active project folder that is nested under the “@Projects” folder. When projects are completed, I move the entire project folder to another folder without an @ sign called “Archived Projects” that is not shown above. There’s no @ sign so that it will drop to a lower spot in my left hand navigation. The “@Issues” folder is perhaps the closest thing to a “junk drawer” that I have. My work involves managing projects and there can be issues that come up much later that really do not belong to a single project folder. I lump them all in the @Issues folder, and despite this large archive of topics, I have found it is still very easy to sort and find things within this folder. The “@My Stuff” are personal notes, reviews, feedback, and other non-project related communication about me. The “@Someday-Maybe” folder has subfolders for projects that are being discussed and planned but have yet to truly move forward. Because projects incubate for longer periods of time at this job, this folder comes in very handy allowing me to focus on the active projects much of the time and still know that these potential projects are being tracked and the communication organized. My work as a coach for the Ventura Canoe & Kayak Club involves managing a few projects and the communication with Board members and National Governing Bodies. Instead of a large list of active projects, I simply have a larger set of archive labels. Most of these projects are ones that have no end date. Note my continued reliance on an “@ Next Action” label for holding the truly actionable items. Because this is a non-profit organization, it’s important to also acknowledge and track all donations and payments. It’s a legal obligation which is why I have created an “@Payments” directory for all receipts and payment related communication. I have far more categories in my personal email account than in my work or volunteer ones. I find having separate folders for the receipts of all purchases, website registrations, travel documents, and an annually created folder for tracking tax related items to be extremely helpful. I have separate labels for email conversations with my wife and daughter and have automated these tags making it really easy to manage, too. The screenshot above also shows what’s in my “@ Next Action” folder. As you can see, this is also a manageable amount of emails. I try to separate my work and personal email whenever possible. It can be hard for people who know me in multiple contexts to know what email address to use with me at times. 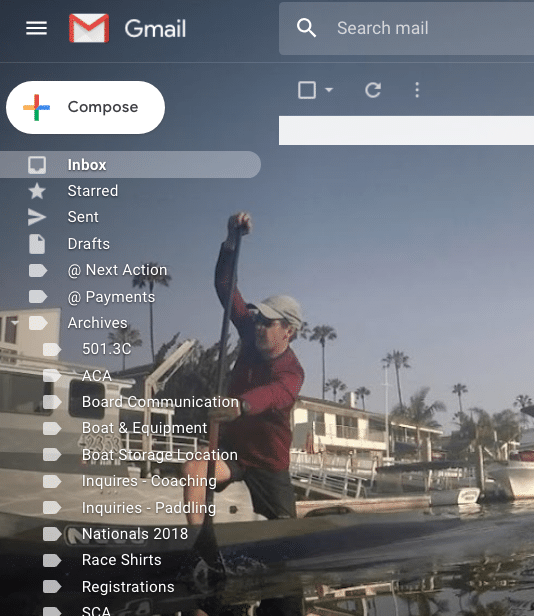 I need the separation of duties and the ability to potentially hand off some of these email accounts in the future – such as the canoe club account. I’m not sure I’ll ever have just one inbox. Learning to scan your inbox and quickly triage what is actionable and what is not is a skill you must develop and gain confidence in executing. 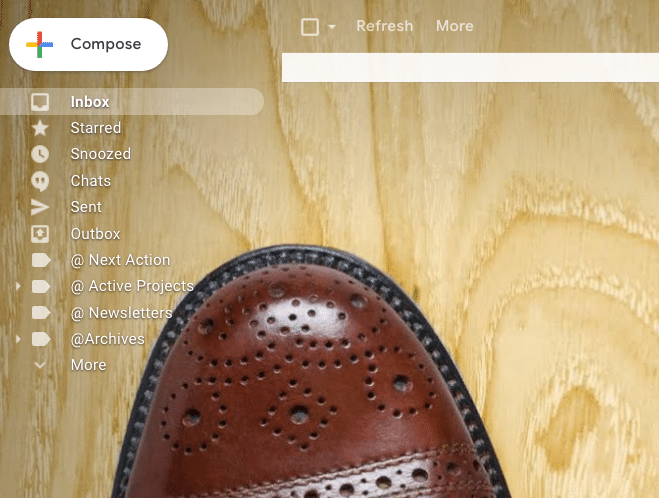 If you don’t have time to process email, don’t just dump it all into your @Next Action folder. Just wait until you can properly process your Inbox messages. Are you on the “To” or the “CC” line? If I am not on the “to” line of the email, or asked a question directly, it’s extremely unlikely this is something that needs my immediate attention. Honestly, very few emails require an immediate response and I think most of us know which ones truly do. Work with your peers to use the “to” line for the individuals you expect a response from and the “cc” as only informational. The only purpose I have ever found for the “bcc” line is in preventing a “reply all” nightmare — I do not use nor make visible the “bcc” attribute. With the latest Gmail app for Android and iPhones, you can view all of your Gmail account inboxes in one window. This is really helpful for clearing out email on your mobile device. Seeking Meaning - How to Define "Work-Life Balance"
This entry was posted in GTD, Time Management, Tools, Work-Life Balance and tagged email, GTD. Bookmark the permalink.